Cotton mill owner - Proprietor of Lever Bridge Mill, Radcliffe Road, Darcy Lever, Bolton. He was the son of William and Frances Gray. His mother was the daughter of Dorning Rasbotham, writer, antiquarian and High Sheriff of Lancashire in 1769, of Birch House, Farnworth. His wife, Magdalene, was the daughter of John Robin, High Sheriff for Denbigh 1836-37. Alderman for Church Ward 1847-53 - never sat as a Councillor. He was present at Dean Mills when the Prince Consort visited them as the guest of Sir Thomas Bazley. On the Board of Guardians for many years. He cut the first sod of the foundations of Lever Bridge Church Schools, his firm contributing £500 towards the building costs. He was a friend and subscriber to the Poor Protection Society and a member of the Industrial School Committee. Member of the Mechanics Institution. He was one of the first members of the Bolton Corps of Rifle Volunteers, becoming an officer. He was appointed a Borough Magistrate in 1850 and a County Magistrate in 1855. He was a philanthropist, giving generously to the town. He was a Friend of the Bolton Infirmary and Dispensary and a member of the Church Institute. During the Cotton Famine in 1862 he contributed £400 for the relief of the sufferers and speaking at a banquet at the baths in 1865 in celebration of the labours of the Bolton Special Relief Committee he said that the money was distributed at a less cost per cent than by any other Committee in the county. When he represented Bolton as Member of Parliament he voted against Lord Derby's Reform Bill in 1859, against the second reading of the Bill for the Abolition of Church Rates, against the second reading of the Nonconformist's Burial Bill and against the Sunday Closing Bill. When the Earl of Beaconsfield (Benjamin Disraeli) visited Manchester in 1872 he told the Bolton delegates that, "We owe a great deal to Bolton. Colonel Gray is a model member. He is most regular in his attendance at the House and if you can always return Gray and Hick you will do." He was narrowly defeated by John Kynaston Cross (Liberal) at the General Election in 1874. This was a great blow to him and he gradually ceased taking an active interest in the affairs of the Borough, retiring to his country seat near Reading and leading the life of a country gentleman. On his retirement as an MP he was presented with a service of silver plate, valued at £350 by the members of the Bolton Operative Conservative Sick and Burial Associations. William Gray's link on the Mayor of Bolton's Chain of Office. 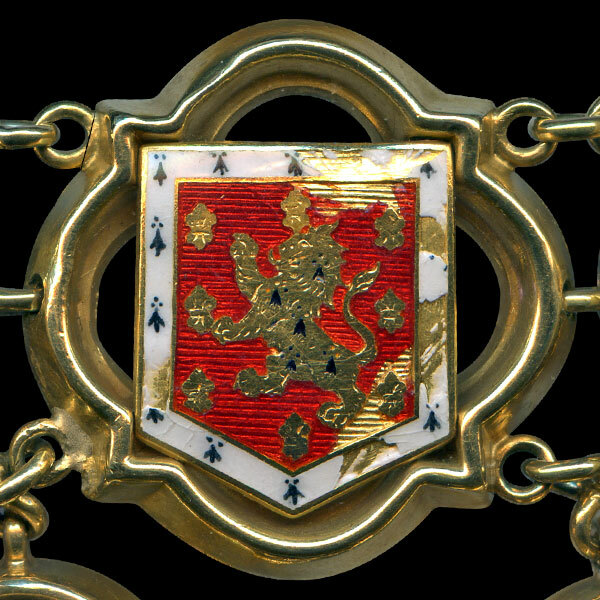 Gules semy de lys a lion rampant or all within a bordure ermine. A variation of several Scotish and Irish Gray arms.